American Academy Ghana Club board members visited with the Rotary Club of Castle Pines on January 16. The Rotary granted the club $500 to help grow the program. Back Row: Howard Rosch, president Rotary Club of Castle Pines; Ben Wolfe, teacher/Ghana Club sponsor at American Academy; and Ron West, president Rotary Club of Castle Pines Foundation. Front Row: Ghana Club board members: Sarah Dhunjishaw (president); Annika Mayers (communications); Will Markowski (treasurer); Cole Caskey (fundraising/advertising); Carly Markowski (communications); and Sophia Wagner (vice president). This year marked the beginning of the Ghana Club at American Academy (AA). Ben Wolfe, one of the school’s science instructors initiated the club, which has approximately 30 students from sixth and seventh grades and a six-member student board. Wolfe’s inspiration for the club stems from his mother’s Ghana Service Learning program at Grand Valley State University (GVSU) in Michigan, which allows college students to partake in a seven-week learning course in the African country. “We are trying to start small but work our way up,” said Wolfe about the club at American Academy. His students are aiming to understand life in the impoverished country and to help students at Challenging Heights, a school for children who have been saved from trafficking. Selling children is common in Ghana where parents with little money are misled into selling children to give them a better life. James Kofi Annan, a former trafficked child who worked for seven years until escaping at about age 13 started Challenging Heights in 2003. The school is a savior for children ranging in age from about kindergarten to high school. Its mission is to ensure a secured, protected and dignified future and life for children and youth by promoting their rights, education, and health. “Challenging Heights rescues kids from slavery and they take the kids to their school. That is like a miracle for the kids because they get to learn and be in a welcoming environment where they are safe from traffickers. Even though there are about 80 kids per classroom and one teacher, they could not be happier,” said AA Ghana Club board member Carly Markowski. In the fall, students from the Ghana Club at AA hosted a book and game drive for the kids at Challenging Heights, collecting and sending nearly 500 items to their peers across the world. According to Sophia Wagner, the club’s vice-president, their next effort is to create care packages full of soccer gear, art supplies, music and more that will be taken directly to the school this summer by the students from GVSU. In January, the Rotary Club of Castle Pines recognized the club for its efforts. The student board gave a PowerPoint presentation to Rotary members. “The understanding that the American Academy sixth and seventh graders brought to the plight of their Ghana peers was profound. 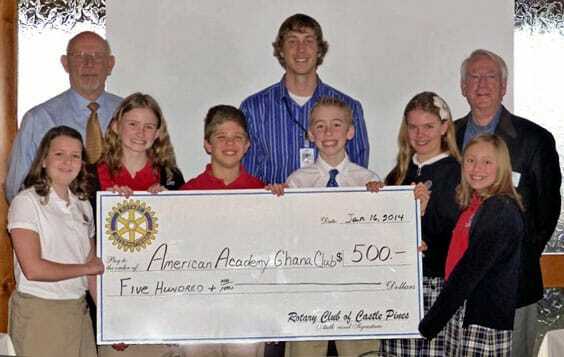 The Rotary Club of Castle Pines is very keen on supporting youth in the community and we were delighted to contribute $500 to the Ghana Club at American Academy,” said Patricia Fiske, Rotary Club of Castle Pines member. “I think what we are doing is important because they really don’t have anything. The kids are so easily happy. Being able to help just feels good,” said Wagner. The Ghana Club recently visited with those at Challenging Heights via Skype. Students introduced themselves and those from Challenging Heights shared that they liked football (soccer to us) and dancing, and proceeded to put on a dance show for those here in Castle Pines. Wolfe says he is very proud of the efforts his students have made. “I hope each kid leaves the club with the knowledge, confidence and drive to help the world around them. I want them to realize the vast potential each one has in making this world a better place,” he said. The club is looking for sponsors to help with the care packages heading to Ghana this summer. Anyone interested in helping can e-mail. To learn more about the Ghana Club at AA, visit aaghanaclub.wix.com/aaghanaclub. To learn more about Challenging Heights, visit www.challengingheights.org.